1990 (H) I bought this car privately in January 1995 for �00, with 33000 miles on the clock. I bought this car as it was an excellent opportunity to buy a lot of car for a cheap price. 605's never caught on in the UK, and as a consequence the second-hand values are truly awful. 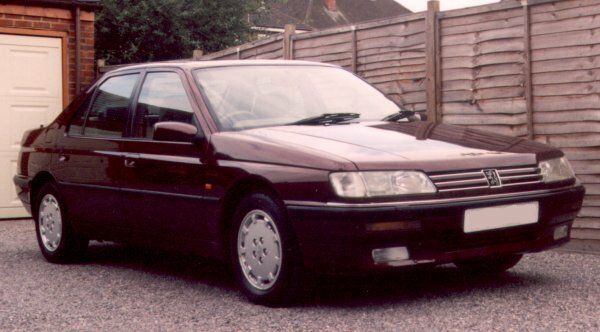 Unfortunately Peugeot bit off more than they could chew when they made the 605. I had all sorts of electrical problems which were never serious, but just niggling. As with the Citroen AX the alloy wheels were truly terrible quality, and I had to do some re-painting to keep them looking smart. The back box of the exhaust was also fairly shot by the time I sold it, and the �0 replacement cost was not promising. Also, after I carried 10 sacks of topsoil in the car the adjustable suspension warning light was on most of the time. However, the car had excellent handling and generally went like stink with 170bhp on tap. I started using the motor-bike during the time I had the 605, and coupled with the various niggling problems, I decided that I'd rather have a smaller car. I traded it in against the Mazda Xedos for �00, with 62000 miles on the clock.